As an media scholar and journalist with an interest in the digital divide, I have long believed that one of the things that media outlets could do a lot better is using their higher profile to give a voice to ‘ordinary people’ who have something to say. I also believe that one of the things that Facebook like other news intermediaries should be trying to do is increase ideological diversity in their feeds. Lastly, I am aware that it is not right to judge what people say online just because it is poorly written technically. And then this happens. This is my top Facebook recommended story on Facebook’s top trending issue. The story’s summary suggests it is from the Huffington Post, which has some journalistic credibility, but if you visit the story itself and look carefully you will see that it is an un-edited, un-curated self published blog posting. It is also badly written, bigoted, and dismayingly lacking in concrete, citable facts. There was a riot of violence and destructions by immigrants in the capitol of Sweden, Stockholm. The police was forced to shoot with ammunition to put and end to it. In Malmö, another city south in Sweden they have struggle with gang violence and lawlessness for years. So when Trump talk about that Sweden have an immigration problem he [Trump] is actually spot on. In the end, I think that what this underlines is another of my personal tech policy prescriptions – we need to ensure that when technology companies are doing socially important work like influencing what news we see, they do not offload this role onto an unaccountable algorithm. Instead, they should ensure that the algorithms are overseen adequately by humans and that those humans are in turn accountable to the public for their actions. Youth interest in elections on the rise? Canada is the latest Western country to find that the youth vote, long thought to be in terminal decline, has in fact been rising. 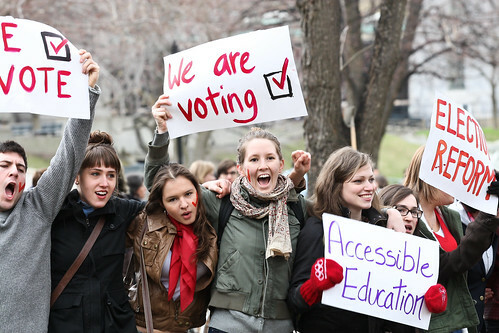 In the run-up to their 2015 elecion there was considerable speculation that Canadian young people had turned out to vote, but proof of the scale of the change has just emerged. Two thirds of 18-24 year olds there voted, compared with 55% in the 2011 election and as low as 35% in the 2004 election (the first where reliable statistics were gathered). This is still, of course, lower than the 77% of the voting age overall who voted (fully 86% of 65-74 year olds voted for example) but is further evidence that there may at last be a shift away from a worrying trend in many western countries of youth disengagement from electoral politics. Similar trends towards higher youth engagement were also visible in the UK as well, in its 2015 election. Nearly six in ten people between 18 and 24 voted then, compared to 52% in 2010 and just 38% in 2005. The reasons for this apparent shift are not yet clear. Some have suggested that increased use of social media by politicians is helping. Surveys in America after the 2008 election suggested that because young people were more likely to be online, they were also thereby more likely to engage in electorally-relevant online activity. There has certainly been plenty of social media activity by politicians across the world, though it is hard to pinpoint any social media-led event or talking point that had an impact during the election itself in Canada. Indeed, the most visible impact social media had in the Canadian election is arguably a negative one. Misbehaviour by some candidates – many of them young – on social media led to 12 candidates being withdrawn and at least as many being criticized after the exposure. While it is important that candidates be held accountable for their political views, many of the blunders seem to have been due to jokes in poor taste or intemperate language in their postings rather than deeply held abhorrent beliefs. As I have argued in my book, “Sharing Our Lives Online: Risks and Exposure in Social Media“, there is a real danger that young people will rule themselves out of involvement in electoral politics fearing the exposure of their online pasts by other politicians or journalists. In the UK if anything the problem seems to be the opposite – despite hundreds of Facebook and Twitter postings by parties during last year’s election, their impact on young people may have been limited because, as Darren Lilleker remarks, “it remains largely a broadcasting tool… they [the parties] use Facebook and Twitter in similar ways to push out messages rather than communicating with their supporters.” Instead of being too personal, they may be not personal enough to really engage with young people. A literature review by Samara, a Canadian think-tank, suggests finding ways for young people to be involved with the parties they identify with short of full membership could be one way to increase their engagement with formal politics. Reducing the voting age to 16 has been mooted as a way to get young people thinking politically sooner, though making this possible for voting in the UK in EU elections for example was recently rejected by the House of Lords). Of course there is a simple, “brute force” solution, espoused by Martin Wattenberg in his US study of youth disengagement – make voting mandatory. In Canada, the governing Liberal party has said it will be considering this option in its electoral reform programme. The real answer may be more simple – as Samara found, young people are active in conventional politics when they are contacted directly by parties and party members. Because historically they vote in lower numbers (and because they are harder to target, being mobile and often lacking landline phones) politicians tend to focus their energies and their policies on older people. Some recent anti-establishment politicians on the left like Jeremy Corbyn in the UK and Bernie Sanders in the US have made much of their connections with young people. But it is not clear there are enough young potential voters to enable them to break through and bring the concerns of the young into mainstream politics. Facts vs analysis in journalism – Doris Day discussed this 50 years ago! The news “long tail” – are readers, journalists’ and advertisers interests diverging? Two recent pieces of news made me think about the issue of timing of news consumed online. Most obviously, online publication pushes journalists to publish ever-faster, but the ability to archive everything means there is also a place for “evergreen” features and explainers. Once done, as long as they are revisited from time to time to ensure they are still relevant, they can continue to draw people to your writing via search, and as a journalism educator I have long encouraged my students to produce and value such pieces. Shirley Li points out in the Atlantic that even quite old pieces of ‘news’ can end up being recirculated as if they were new. Her concern is that people sometimes don’t realize that online news recirculated this way is outdated (because timestamps on stories can often be hard to find) but this also suggests once again that older news stories/features can also have continued value. Alarmingly, however, it seems that online advertisers (at least in one case) place very little value on readers’ attention if it was drawn by old material. According to Jim Romenesko, journalists for Forbes magazine (who are paid per click) will be paid only a quarter as much as before for visits to pages that are more than 90 days old. According to a memo passed to Romanesko, “advertisers are increasingly buying premium ads for new content, not old”. It is unclear why advertisers would necessarily prefer a view of a new story to a view of a similarly interesting and accurate but older story. However if this were part of a larger trend, what would be the implications? Will this encourage editors to superficially refresh even “evergreen” stories to make them “new” for advertisers? (Keeping a closer editorial eye on older stories might be no bad thing). Might this mean that rather than updating old stories, they are deleted or unlinked and new stories based on the old ones will be written (which among other things would complicate site archives and contribute greatly to the problem of “link rot” where links to old journalism vanish)? Are we seeing the death of the discussion forum? I am used as a journalism professor to suggesting to my students that for any specialist topic – a disease, a hobby, a location – they should seek out the online discussion forums chat rooms or mailing lists that relate to it. These can act as sources of expertise or places where they can seek out opinions or story ideas. Only when I have suggested they do this recently and have gone to look for them myself… I found surprisingly very little. It used to be that searching for “[topic] messageboard” or “[topic] forum” or “[topic] mailing list” would nearly always find something. I didn’t even find a discussion board by and for Canadian post-secondary students akin to the UK’s Student Room. Have the problems of troll management killed most of these off as it seems to be doing to media comments sections? Has Facebook eaten up most of that discussion time? (I am not finding a lot of very active special interest Facebook groups either – at least not proportional in size to what seems to have been lost). My students seem to see Reddit subreddits as their “go to” source of topic-centred conversation but Reddit is again not big enough to replace all of the little conversation spaces that used to be around (is it? ), and ISTR it trends pretty young. Twitter is a) not usually the same as a message board in terms of length, depth and continuity of dialogue and b) my sense is that it is more a discussion tool for elites than for a broader range of participants. Where else should I be sending my students online to find and solicit citizen views these days? And with my communication studies hat on, if the internet-using public loses the “habit” of using online discussion forums, would this not undermine one of the important means the internet could function as a potential space of public “sphericules”? I saw this and was momentarily intrigued. Then I clicked on the pic to see it full size. It didn’t get any bigger and was therefore still unreadable. So I ended up having to go visit the original story at Journalism.co.uk – now the individual text was readable but you couldn’t get a sense of the meaning of the whole without going full-screen to this from Mattermap. And then? All it turns out to be is a grouped collection of tweets, which were all available and more easily readable in the text of the website below anyway. I got there in the end but three clicks, some head-scratching and a scroll later. Sometimes good old-fashioned text is all you need! I’d read and heard about the horrific tsunami that hit Japan three years ago, but none of it moved me in the way this simple podcast eyewitness testimony did. Audio is the most intimate of mediums, and lets the mind fill in its own pictures of the events described which I think are more vivid than any video could be. And unlike many conventional documentaries and news programmes, this 15 minute first person format let the witness’ testimony speak for itself. Carl Pillitteri, a Fukoshima nuclear engineer told this story at a Moth event (the Moth is a non-profit organization which runs events where people talk about their lives live and without notes). If you are using images online as a journalist you need to ensure that you have the rights to put them on your site legally. If you do a Google image search, click on “search tools” and select “usage rights” that’s one way to ensure what you’re finding you can use, but in addition image libraries like Getty Images contain a lot of very high quality images (> 35m at last count) including pictures relating to the latest news. This is why they can charge for them and put watermarks over the images you can see for free so you don’t pirate them. Now, however, tired of trying to fight the many online pirates of their content, Getty seems to have decided to make it easy for people to use their images online for free in controlled ways with attribution. They are defining “non-commercial” (and therefore permissible) uses of their images quite broadly so as long as you use their image embedding tool you should be able to legitimately use their many pictures on most journalistic projects online (for print use you would still need to purchase them). There is already speculation that the other major picture agencies may do likewise. Here’s how to take advantage of Getty Images’ new embed feature (and its limitations). Getty’s “front page” for searching embeddable images is here. Comments (1)	Next Page ?